These potatoes are great and can be made a littler earlier in the meal process and then served at room temperature. Bring and salted water to cover to a boil in a large saucepan. Cook 10 to 15 minutes or until tender; drain. 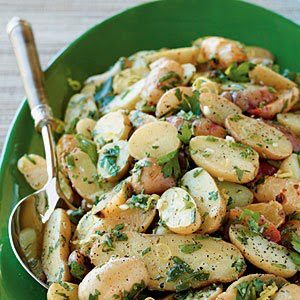 Toss potatoes with chopped fresh herbs, olive oil, fresh lemon juice, and minced garlic.